With patio season right around the corner, it’s handy to have furniture that can pull double duty when you need it to! Busy night out in your outdoor bar area? Grab some seating from indoors! A larger party just came in to dine? No problem, grab a table and base and give them some more space. Furniture that can be properly used inside and out can be extremely helpful for restaurants that shift their layout to where guests prefer to dine. Whether you prefer classic design or something a little more trendy, East Coast Chair & Barstool has the right furniture that works harder inside and outside your restaurant. We’ve taken one of our most popular rustic industrial styles and added the right pop of color! With six different colors, you can keep your color theme neutral (Black, White), whimsical (Sky Blue, Orange), or bold (Kelly Red, Kelly Blue) with the Distressed Viktor Collection. So what makes this collection different from our other Viktors, besides the fun colors? 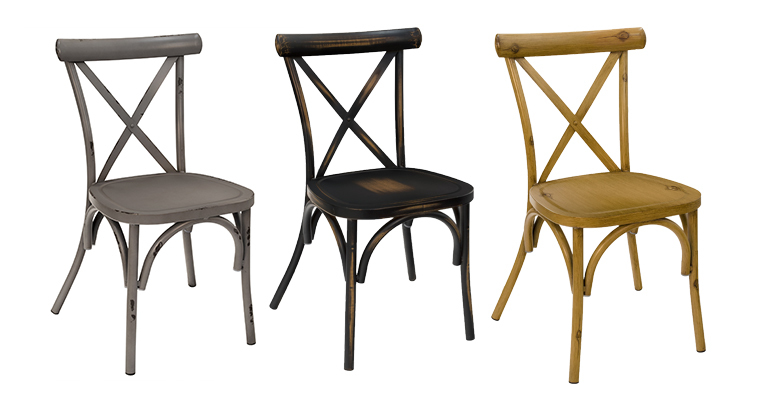 These Distressed Viktor bar stools and chairs go through a 10-step finishing process, ending with a strong powder coat. Through this process, the 16-gauge steel frame becomes durable enough to use inside or outside your restaurant. These bar stools and chairs have the option to add a vinyl or wood seat, but these seat options are only warrantied for indoor use. To be able to use these Viktors wherever you need in your restaurant, leave the seat metal. The weathered style is a great addition to your dining room space or patio, and right on trend! Add a mid-century modern feel to your café tables or outdoor patio with the Hendrix chairs. 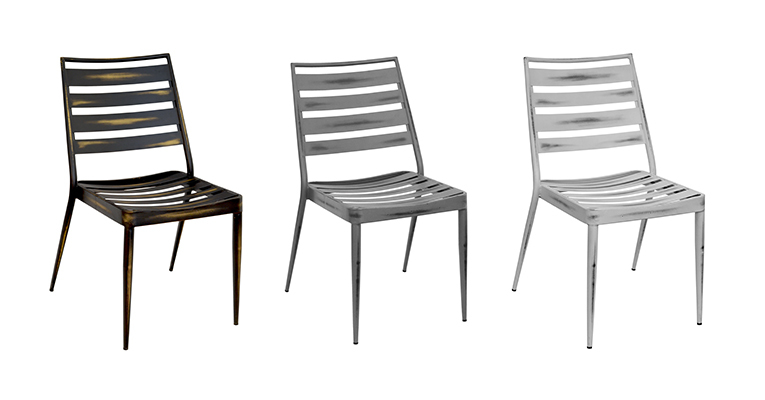 These chairs boast a fully welded steel frame that’s been e-coated to make them durable for any commercial environment. The Hendrix chair has an overall squared silhouette with a ladder-style back that feeds into its classic appeal. Enjoy design that you won’t find anywhere else, with unique colors that will set your space apart. Playing on the rustic trend, Hendrix chairs are available in classic colors (Distressed White, Distressed Gray, Distressed Black) with distressed markings. And if you have a slower night where you don’t need the chairs on in your dining room or patio, Hendrix chairs are stackable for easy storage. The Carlisle chair has a distinctive cross back design with stylized frame that never goes out of style. These chairs are fantastic for coffee shops, bakeries, and cafés that need to accommodate curbside tables as well as extra seating inside. Strong and durable, the Carlisle chair’s 16-gauge steel frame is e-coated in three different colors (Distressed Black, Distressed Gray, Distressed Oak). This e-coating is what makes the Carlisle tough enough for indoor and outdoor use. To complete the look, the chair has artistic distress marks to give them a weathered, industrial look. An ash wood seat is available for the Carlisle chairs but is only warrantied for indoor use. The design of the frame allows these chairs to stack, making it easy to have them on hand and ready when you need to make space for extra customers. Beautiful and durable, IsoTop table tops are a must for a restaurant that demands versatility in its dining layout. These table tops are a high-density laminate that have a modern European design and boast a sleek ½” edge profile. 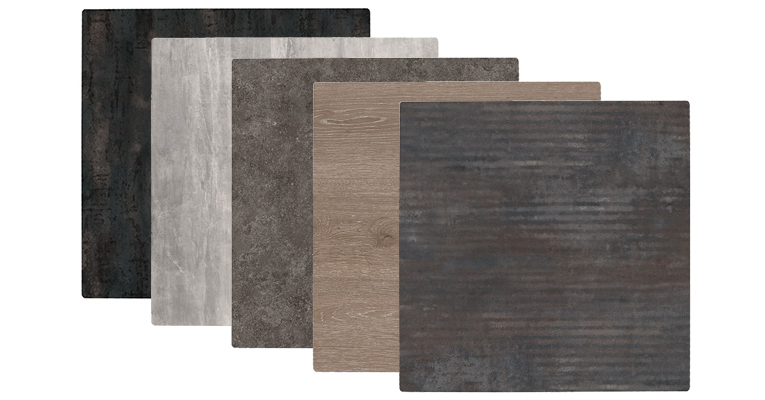 Get the look of wood (Gray Oak), metal (Metal Line, Black Steel, Dark Mica), or marbled top (Cement) with a flat surface and added layers for increased durability. These tops are pre-stressed, UV-resistant, and have a dry matte finish that create a smooth surface. IsoTop tables are great for tight spaces with their 32” x 32” square or 32” x 48” rectangle top size options. Whether you’re looking for a table base with a little more flair (Vienna) or one that can hold an umbrella for your patio (Palermo, Newport), we have some bases that will support your table tops, inside and out! We’re shaking up the classic disc design with the Vienna base. This base is made of strong e-coated cast steel, making it ideal in your dining area or on your patio with its stylized ridge design. Depending on what table you’re supporting, the Vienna is offered with an 18”, 24”, or 30” plate and comes in table or bar height. 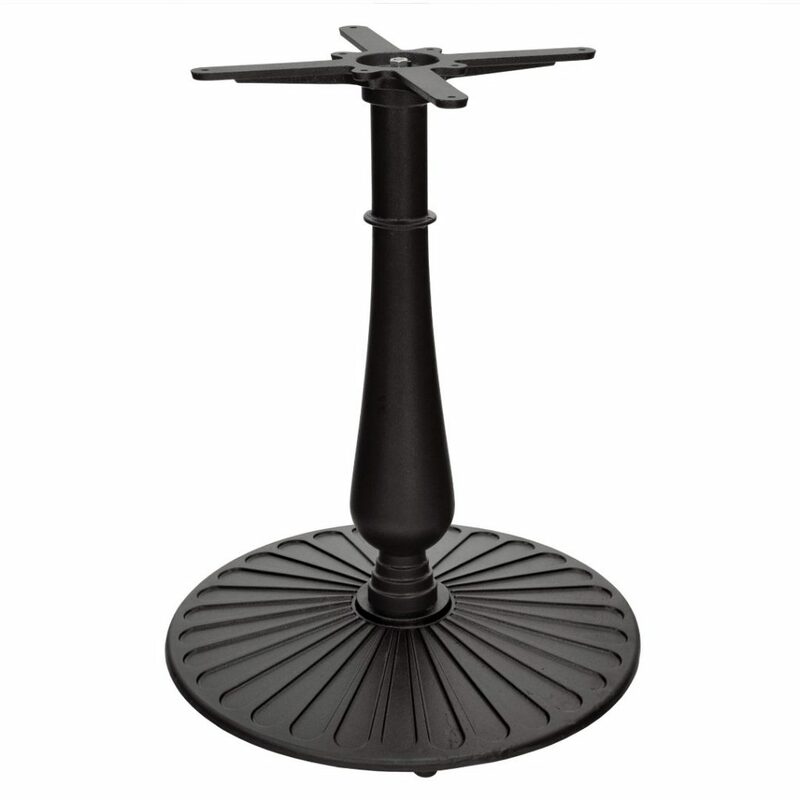 The Newport table base is an instant-classic, especially for outdoor spaces, with its built-in umbrella holder. The Newport’s steel frame is powder coated black for a streamlined appearance and unbeatable durability. Choose from an 18” or 22” base size in table or bar height for your table tops. Get the support you need with the Palermo single or double table base. If you think you’re going to need a place to support an umbrella, go with the single Palermo with its built-in umbrella holder. Need more support? Try the double Palermo base. 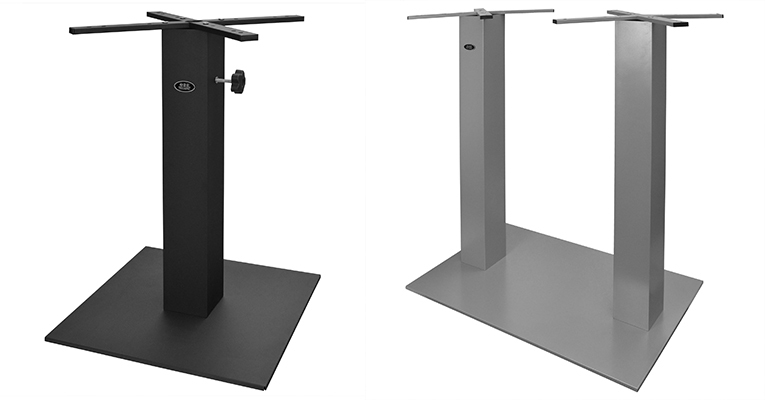 Both the single and double styles are available in table and bar height. Regardless of which you choose, the Palermo is made from heavy duty steel that won’t corrode. 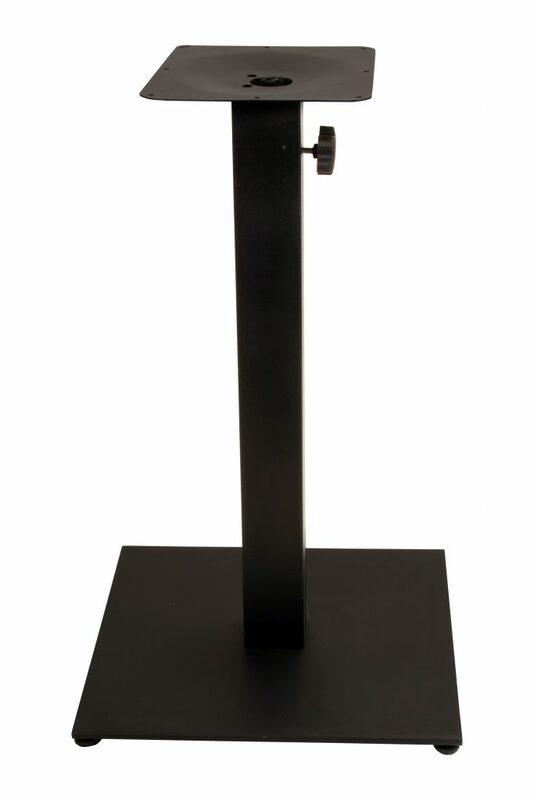 Get the right base to match your décor (inside or out) by choosing a black or silver Palermo table base. Each of these bases are available in have self-leveling floor glides for extra stability. Put your mind at ease by finding commercial-grade restaurant furniture that can be used inside and out. This will help keep your warranty intact and your restaurant layout flexible. Have a question about a product we discussed? Please call our customer care team at 800-986-5352 for more information. Be sure to also check out our catalog for all the latest products coming to East Coast Chair & Barstool.